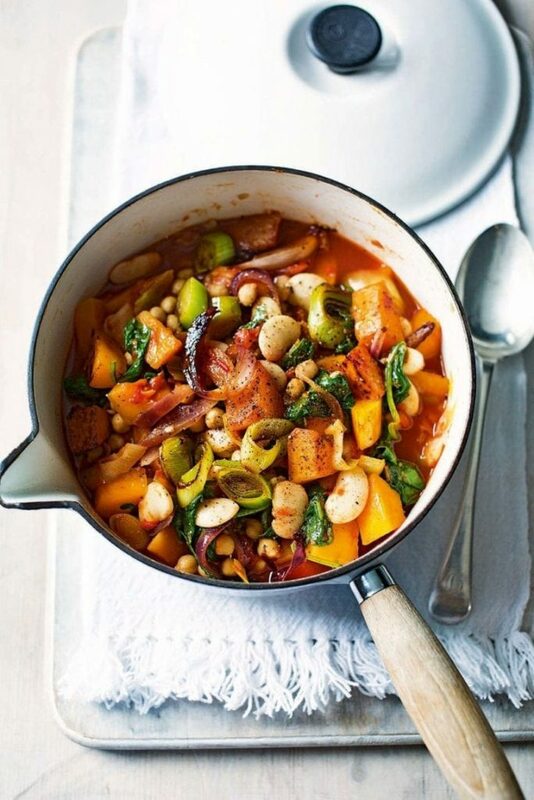 Spicy Squash & Bean Stew Recipe the right dish for colder days. This time we have a beautiful vegan Squash & Bean Stew Recipe made of squash and kidney beans. Spicy Squash & Bean Stew the right dish for colder days. It is a recipe which a whole family can enjoy and get a warm and cozy feeling. Now is the best time to find different kinds of squash fresh and locally grown. Here you can use a butternut squash together with butterbeans and chickpeas. Enjoy this vegan stew recipe as a healthy midweek meal. A recipe everybody will love, not only vegans. Try it, enjoy it! You know when you’re absolutely shattered and you can’t be bothered to cook? I totally get it! We’ve got a one-pot dish that is easy, that will mean you can serve up something warm and comforting. Plus this will serve up to 4 people, so you can either eat it for another night or is great if you got more mouths to feed. Enjoy this super tasty, warming, throw it in a pan kinda meal that will definitely have you licking your plate!